Make your own hummus. It's not that hard. – J.
Hummus is so popular in the United States and worldwide that the global market for commercially prepared hummus is expected to top $1 billion by 2022. So why make your own? The simple answer is that homemade hummus tastes great. 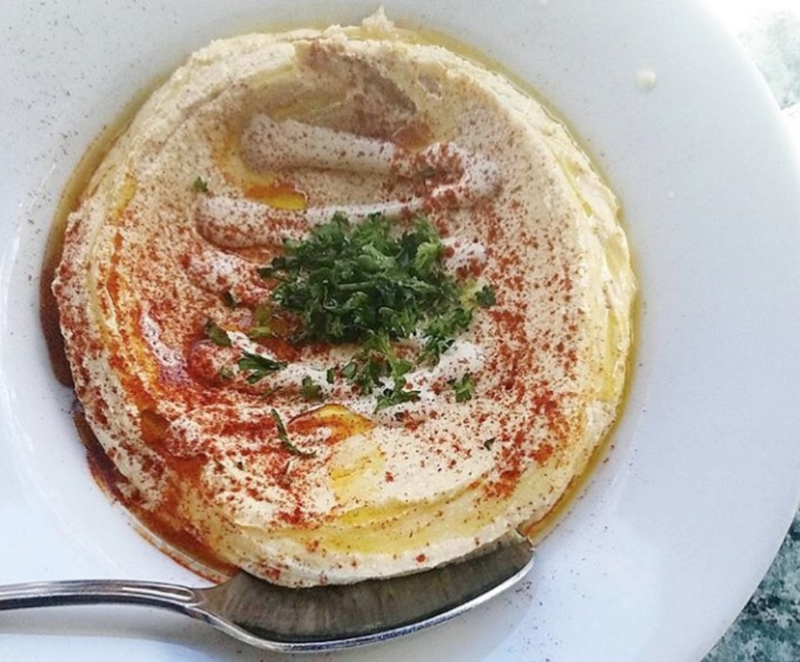 Hummus is more than a dip. 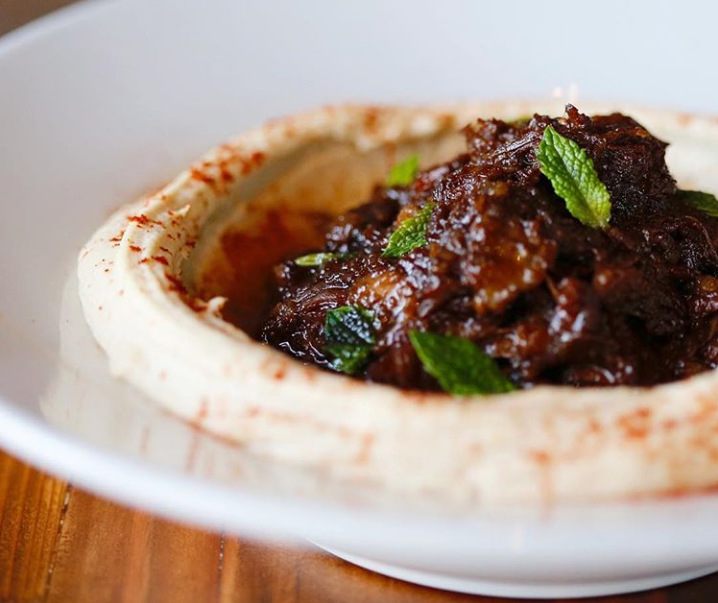 In Israel and the Middle East — and at Bay Area restaurants such as Village Hummus in San Mateo, Sababa in San Francisco and Oren’s Hummus in Palo Alto, Mountain View, Cupertino and San Francisco — it is the basis of meals topped with vegetables, sauces and even meats. Here is a recipe for hummus that includes garnishes and an optional lamb topping. If desired, replace the canned chickpeas with three cups home-cooked ones. Short on time? Use the garnishes and topping with four cups of commercial hummus. No hand blender or food processor? Crush and mince the garlic and use a potato masher to make the purée. Mash a few of the chickpeas with a spoon. If they mash easily proceed. If not, simmer in pot with their liquid until they do. Drain chickpeas. Rinse well. To remove skins (optional), place ¼ of the chickpeas on a clean dish towel. Cover with a second towel and rub. Pick out or pinch off loosened skins. Place skinless chickpeas in large bowl. Repeat with remaining chickpeas. Set aside ⅓ cup of chickpeas for garnish. 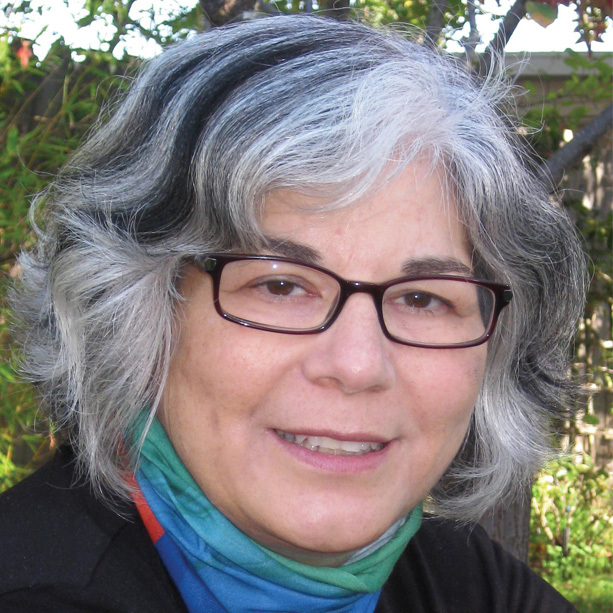 If using hand blender (also called an immersion or stick blender), place garlic, ¼ cup olive oil and ¼ cup chickpeas in 2-cup measuring cup or wide-mouth jar. Blend until garlic and chickpeas are very finely chopped. Scrape into large bowl with other chickpeas. Add tahini, juice and remaining oil. Blend until smooth as possible, scraping down bowl and blender blade as needed. Add water. Blend until smooth and creamy, adding more water if necessary. Taste and add salt and additional tahini or lemon juice if needed. Blend well. To use food processor, put garlic, ¼ cup olive oil and ¼ cup chickpeas in processor bowl and process until finely chopped. Add remaining chickpeas, oil, tahini and juice and follow directions for hand blender, processing instead of blending. For a side dish, use the back of a spoon to swirl ½ to ¾ cup of hummus over the bottom and sides of a 6- to 8-inch shallow bowl. For a main course, swirl 1½ to 2 cups in an 8- to 10-inch bowl. To use as a dip, spread out on a platter or large, shallow bowl. Garnish as desired (see below). Serve with fresh pita. Top each serving with a proportionate amount of each ingredient. First drizzle oil, then sprinkle sumac (or paprika) and top with lamb (if desired), then swirl on tahini (or tahini sauce), scatter parsley and chickpeas. Lamb topping: Sauté ½ cup chopped onion in 2 Tbs. olive oil over medium heat until golden. Add 1 Tbs. minced garlic. Sauté until golden. Add ⅛ tsp. ground black pepper, ⅛ tsp. cayenne powder, ½ tsp. each salt, ground cinnamon and ground cumin. Stir. Add 1 lb. ground lamb, sautéing and breaking up clumps until almost cooked. Add 1 Tbs. minced fresh parsley and 2 Tbs. minced fresh mint. Sauté until cooked. Use hot or warm. Tahini serving sauce: Use this recipe from one of my recent columns..